Nikon Ambassador Corey Rich unboxes a KeyMission 360 and offers a step-by-step set-up of the camera and a compatible iPhone®/iPad® and Android™-powered smart devices using Bluetooth and Wi-Fi®. The various menu items in the SnapBridge 360/170 app are discussed as well. Then watch Corey shooting with the camera, downloading the content to a smart device via the app, as well as to a computer for editing with the KeyMission 360/170 Utility software. Lastly see how to convert video files for uploading to YouTube™ or Facebook for a true 360° immersive experience. The KeyMission 360 camera utilizes the SnapBridge 360/170 app for smartphones and tablets to download and view images, take photos and videos, as well as change camera settings. Follow the step-by-step instructions to connect your iPhone® / iPad® or Android™-powered smart device running the SnapBridge 360/170 app to the camera via Bluetooth® and Wi-Fi®. If you're having difficulty pairing the KeyMission 360 to the SnapBridge 360/170 app, you'll want to troubleshoot the issue. To do this, you will need to un-pair and re-pair the KeyMission 360 and smart device. We've put together detailed instructions as to how to un-pair and re-pair your KeyMission 360 camera and iPhone® or iPad®. The KeyMission 360 action camera connects to your smart device using both Bluetooth® and Wi-Fi®. Follow these step by step instructions when connecting you smart device to the KeyMission 360 via Wi-Fi®. Which media card should I use with the KeyMission 360? It is important to choose the right media card, for the ideal experience when using a KeyMission 360 action camera to shoot still photos or video. Learn which are the recommended speed rated media cards. You’ve got a few options for how you set up your workflow with regards to getting your 360° videos and photos from the KeyMission 360 to a compatible smartphone or tablet, personal computer and ultimately the web for viewing and sharing. Learn how to convert files for uploading to YouTube™ and Facebook. We've put together a helpful FAQ or list of frequently asked questions that should help you navigate your way around the KeyMission 360 action camera and its smart device app, SnapBridge 360/170. 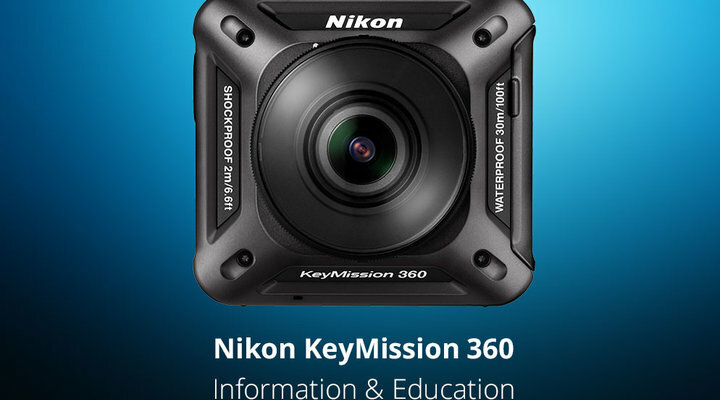 Here you'll find information on updates to KeyMission 360 firmware and SnapBridge 360/170 app updates, as well as other important information from Nikon. Here you'll find updates for the KeyMission 360 firmware. Click the links to go to the App Store or Google Play respectively, for the SnapBridge 360/170 App. Choose your smart device's operating system below.